The construction of an elaborate set, perhaps then the most elaborate in French film history, and six months of grueling shooting in painstakingly-managed chronological order were only the beginning of the struggle for Carl Theodor Dreyer's 1928 silent masterpiece “The Passion of Joan of Arc.” Below is a timeline of the film's release and the many twists and turns in its perilous journey through nearly ninety years. Precisely none of this is compiled from original research by me and I have listed my primary sources below; they deserve all of the credit, especially the detailed studies by T.A. Kinsey and Tony Pipolo. I therefore do not post this as scholarly or definitive work, but simply as a brief summary of the research I have done in preparing my current class on the films of Carl Theodor Dreyer, which I am currently teaching at the Bryn Mawr Film Institute. I welcome all of my students who are checking in as well as any other readers who have kindly taken the time to read my humble little blog. April 21, 1928: The film premiers in Copenhagen. This initial release is believed to have been screened silently (as this was Dreyer's stated wish) and had no credits at all as Dreyer wanted viewers to feel as if they were peeping “through a keyhole” at reality. April 26, 1928: A free matinee screening is opened to 1,800 unemployed workers who filled out response cards, reportedly providing wildly enthusiastic feedback. Oct 25, 1928: The film begins a month-long run in Paris to substantially less enthusiasm than it experienced at the initial Copenhagen release. It would play with a score and with unauthorized cuts. A different version would be released nine months later that was allegedly better received, but the film would be a commercial flop in any version. Dec 6, 1928: The negative had been shipped to the UFA studio in Berlin for the film's German release, but is destroyed in a fire. Dreyer immediately begins assembling a second negative from alternate takes (fortunately he had many, many takes, shooting at approximately a 40:1 ratio). Supposedly this second version is a shot-for-shot match and only Dreyer and the film's editor Marguerite Beauge could notice the difference. In 1929, this second negative would be reported destroyed by fire in a French studio. Dreyer's spirit was broken and he did not work on another version of the film. Prints made from both negatives survived and would assure that the film would continue to be seen, but these would gradually deteriorate with each projection. Mar-May 1929: The film plays in the United States in a slightly shorter version. Like most versions, this one was usually played with musical accompaniment and likely had credits attached. 1929: The film's UK opening is delayed for about a year as British censors object to the portrayal of the British military in the film. 1933: One of the strangest of the many different versions of “Joan” is released, one put together by B-movie producer Sherman S. Krellberg (responsible for such films as “Fighting Cowboy” and “City of Lost Men”). It would run barely an hour, had no intertitles, and featured narration by radio personality David Ross. It was advertised with the horrifying tagline: “Sherman S. Krellberg Presents A New Thrill In Talking Films.” According to author Tony Pipolo (1988), an advertisement featured Krellberg's name more prominently than Dreyer's. Rights to the film were already under dubious protection (if any) in certain countries just a few years after its initial release. 1950-52: A negative of the film turns up at Gaumont studios in France, possibly the one reported lost in the second fire. This was handed over to the Cinematheque francaise where film historian Joseph-Marie Lo Duca took charge of a controversial re-release with a classical music score (the addition of which required cropping a portion of the film along the left side of the frame), some intertitles replaced by subtitles and some remaining subtitles reprinted on backgrounds with stained-glass windows and other Church imagery. It debuted at the 1952 Venice Film Festival. 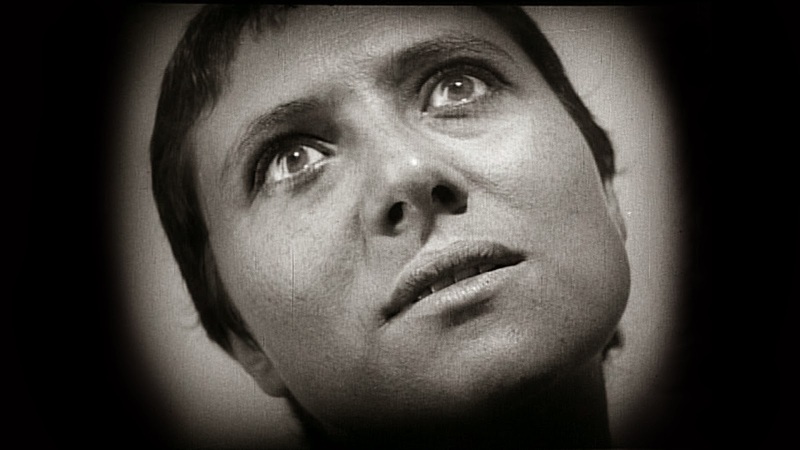 Dreyer hated his version (“there are no words which can express how Lo Duca has made my film on Joan of Arc banal”), but it wound up being the one most often exhibited over the next 30 years in many countries. 1960s: The Danish Film Museum works on a 'best guess” print put together from the many different and largely unauthorized prints in circulation at the time. The term “best guess” has fallen under great scrutiny by film scholars. These numerous prints include copies stored at MOMA, the National Film Archive in London, one from an Italian private collector and several others. 1981: One final bizarre twist in one of the strangest release stories of all. A custodian at an Oslo mental asylum discovers a pile of film canisters in a cupboard. They are sent to the Norwegian Film Institute where they sit for three years until they can be processed by the staff. It turns out to be a negative of “The Passion of Joan of Arc” still wrapped and with the Danish censor's seal intact; it has no credits and has Danish intertitles supervised by Dreyer. It is likely this print was ordered by the hospital's director Dr. Harold Arnesen though it was obviously never played. There was considerable debate over just how different this “Oslo print” was from prints already in circulation (roughly summing it up: there are a few more shots, some of which are of different lengths, but no major additions or omissions; however even small differences cannot be ignored; most importantly, the quality of this negative was quite good.) The Oslo print, extensively restored by the Cinematheque francaise (who replaced the Danish intertitles with French ones and added credits), has now become the most commonly played one. It was the basis for the Criterion Collection's 1999 release of “Joan” on DVD. Michel Simon is listed in the opening credits of the film as playing Jean Lemaitre; you will find a similar listing currently on IMDB. This is incorrect. Simon only appears in one very brief close-up and is glimpsed in the background of another shot. Simon would become a very famous French actor and it is possible that any “mistakes” in later credits added to the film were not corrected in hopes of attracting his fans to the movie. While the version of “Joan” on the Criterion DVD played the film at 24 frames per second, the film has frequently been screened (at venues like The Anthology Film Archive in New York City) at 18 fps, adding a considerable amount to its run time (from 82 min to 110) and also providing challenges for any music played to accompany it (if music is used). Film historians and archivists plan to battle to the death over this exciting topic. This Oslo print has 1517 total shots (including 174 intertitles), about double the amount of the typical Hollywood film of the era. Of these shots, fewer than 30 show the same character from shot to shot (i.e. a character walking from one part of the room to another), an unusual feature that contributes to the jarring, disorienting sense many viewers get from this film. Thanks to Casper Tybjerg and David Bordwell for doing the counting on that. David Bordwell, The Films of Carl Theodor Dreyer (University of California Press, 1981). T.A. 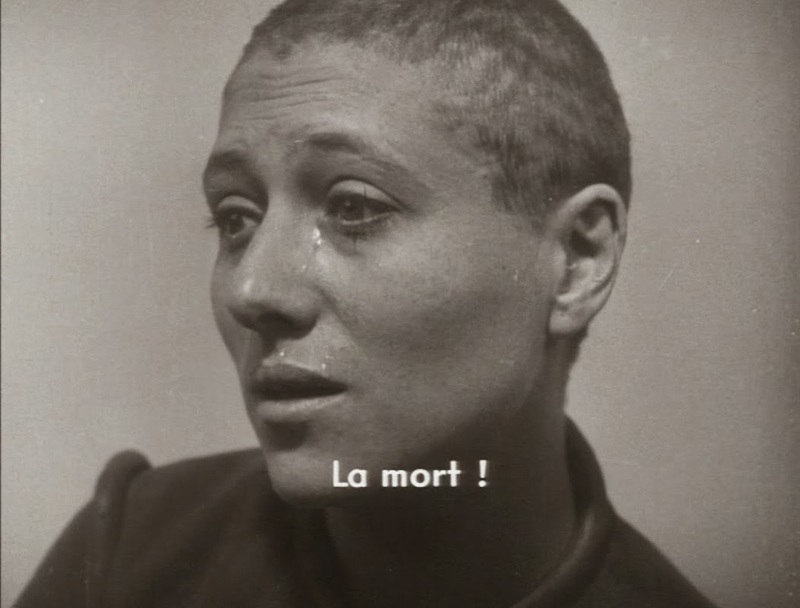 Kinsey, “The Mysterious History and Restoration of Dreyer's 'The Passion of Joan of Arc',” The Moving Image: The Journal of the Association of Moving Image Archivists, Vol. 1, No. 1 (Spring 2001), pp. 94-107. Tony Pipolo, “The Spectre of Joan of Arc: Textual Variations in the Key Prints of Carl Dreyer's Film,” Film History, Vol. 2, No 4, pp. 301-324. Tony Pipolo, “Response to T.A. Kinsey's article on Dreyer's 'Passion of Joan of Arc',” The Moving Image: The Journal of the Association of Moving Image Archivists, Vol. 2, No. 1 (Spring 2002), pp. 184-188. Belle Toujours - Manoel De Oliveira Toujours!